Hi there! I’m participating in Disco Deals this month and I’d love for you to stop by and check out my item, in addition to all the other great designers including A.D.D. Andel, Cherry, Clutter, Dragon Charm Designs, House of London, Nzuri, Sn@tch, Somnia and Status. You can get to the Disco Deals Bazaar in world by using this link! My item is called, ‘spring pearls’ and it’s lots of pearls and bows goodness for you. Enjoy! I have an entire folder in my inventory called ‘new clothes’ and it’s where I stash stuff till I actually wear it, then I file it in the gadzillion folders I have for clothes. The folder is huge at the moment. I have been buying for weeks and then wearing the same thing for days while I get sucked into working on something new! In any case I just bought this GORGEOUS dress from Sn@tch. LOOK AT THE SKIRT. I love it. I love wearing this – it moves with my av so beautifully, and looks like crepe. I tried it on this morning and thought, oh man I have the perfect shoes for this and pulled out the Ingenue special shoes from the last shoe fair, and walla! For accessories, I’m wearing my own FREE Alex hair – the flowers in the hair band mimic the flowers on the shoes. The jewelry is a new set that is out in the store, Delicate Drama earrings and bangles, an intricate design. So I did release a new set that is currently out for Disco Deals – and also picked up some gorgeous stuff for myself! I think right now I’m just in love with anything from Sn@tch as I find myself usually wearing outfits from there, and/or building around the great necklines. At Disco Deals RIGHT NOW – is the stunning Avril lingerie. I like this because it’s just so vintage. Classically so. I paired it with the decidedly non-vintage GOS Dare Boots also currently at the DD Bazaar. 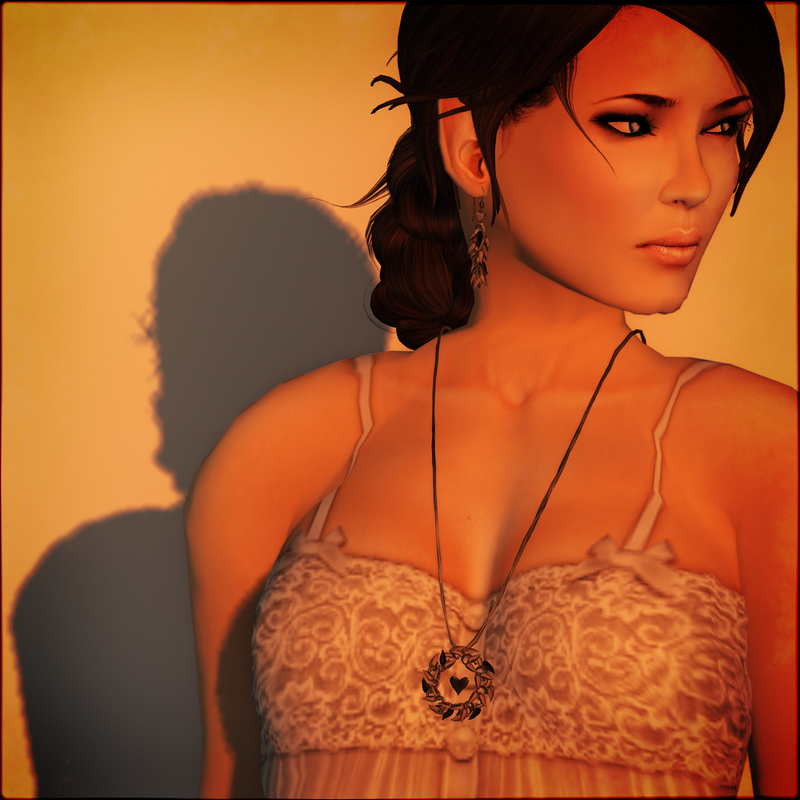 I’m wearing my own new Jenny 2.0 hair in brown 5, and the In the Mood set on sale at DD. It’s a DD sort of day, for me! The skin I’m wearing is LAQ Mima 02 in Milky tone, my new favorite eyes from Illusory and my old faithful eyelashes from La Syphilde, but sadly no longer available. Here’s a teleport to SCD’s Disco Deals where you can purchase these items! Dark Mouse for Disco Deals! Hi all, yes it’s that time, Disco Deals time – and the designer line up is sooooo awesome! I invite you to come to the Bazaar and check out the awesome bargains available! This month’s line up includes – Clique, Dark Mouse Jewelry & Hair, Gesticulate!, GOS, Karizmatik Modern, Miao, Riddle, Sn@tch, Somnia and sur+! I will have a lovely necklace and earring set available in gold, silver or copper – I’m calling it, In the mood! Why? Because you can share your mood with others! The heart color changes to, “cold, sweet, pure, revenge and hot.” I hope you like! Here’s a teleport to the Disco Deals Bazaar! Dark Mouse Returns for Disco Deals! Hi there! I’ve been out of the loop for a while but I’m back now! I have a new release for Disco Deals I call Bohemian Flare. Stop by at SCD’s Disco Deals & the Riot Room for all the cool deals! 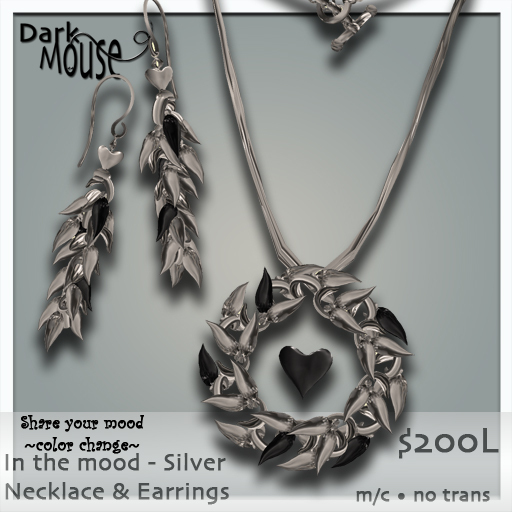 Aside from Dark Mouse, you’ll find gorgeous stuff priced at $99L or less from Miao, Karizmatik Moderne, Callie Cline, Somnia, Ivalde, Sable Rose Jewelry, Sysy’s, gesticulate, Savoir Faire Shapes and my own personal favorite, the ever fabulous Sn@tch! Here’s a teleport directly to the bazaar!